I didn't know Goodwill had this kind of store, so I was shocked when I saw it. A friend and I went to check out the newest one in our area. Totally AMAZING. The carry some new and donated items. Everything is set up and displayed beautifully and the building is huge. I'll let you just browse. Are you as amazed as I was. If you live in the Phoenix area this one is located at the 101 and Thunderbird. Check out your area and see if you have one too. Great store and super fun. Wow ! Wish we had one of those stores here ! Wow! I would probably spend HOURS in there. You are so lucky that you have a store like this nearby! Oh may! How I wish I lived there!!!! Very impressive, they are on the right track!! Wow Marty that is the nicest Goodwill Store I have ever seen. I saw a lot of treasures in your pictures I would love to have. That place is awesome. It looks like a HomeGoods store--how were the prices? My father told me there is also a GoodWill website you can purchase from too. Wow...that is awesome! It's probably a good idea that there is not one close to me :) I have been on the Goodwill website but I would much rather see the things in person. Oh my goodness, gulp...oh WOW! Had no idea there's such a thing out there. Seriously?! Wow! No GW of that kind around here. So what did you buy??? Hi Marty. That looked awesome. We have a Habitat for Humanity for Humanity Resale store by us that is nice, but not that nice. What were the prices like? Yes they do. I asked one manager about the changes while shopping at a Goodwill and she told me they are upgrading their image. They also have started opening smaller stores that are more like a clothing and gift boutique. In Austin I have noticed the prices are going up for decor items too. wow..wish we had one around here...I'll bet you found lots of goodies.. I had no idea these existed, Marty! Can't believe this is a Goodwill! Looks nothing like the Goodwills around me. Looks more like a World Market! They must have hired someone with excellent taste! wow. what a great store! never knew Goodwill had these either. Very interesting. How were the prices? Our GW prices are terribly high. I barely go there anymore. This is amazing, Marty! I'd love to find one like this near me. I'm going to look and see if there is one. I'm wondering as to the pricing, too, as they seem to go a bit high at the regular GW sometimes. Definitely not a GW store like that in my area. I don't go to them in my area any more they are so bad. Hope you are enjoying the week. WOW!!!!! Looks like a design showroom outlet store!!!! How are the prices though Marty? Were they affordable? Wonder what you grabbed! Wished we had one close to our home. You must have been doing the happy dance. That would be a super fun day! When do we see what you came home with? Wow, Marty, I have never seen a GW store like that before. This is amazing! Wish ours would do this! This is unbelievable! I would love to go! I hope you were able to find something you wanted...how could you not?!!! wowza I've never seen anything like it! I posted about my favorite thrift store today! Great minds think alike! heehee! Sweet hugs! Wow, our Goodwill would never have that selection! I could move right in! I loved browsing via your pictures! How are the prices? Our Goodwill has the highest prices of any thrift store. My gosh, couldn't believe my eyes.....that is amazing!!! You find the best stores out there!!! Oh my goodness. I see so many things I would like to buy. Maybe it is a good thing I live so far away. HA! HA! Maarty, how did the prices compare to the other Goodwill stores on their used items? That is the best put together Goodwill store I have ever seen. Oh my, This is like retail paradise! I can spent hours in this place:) Wish I had something like this nearby! Wow wow wow! I am always surprised when I read about Good Will finds, I never dreamed their stores good be so well organized and styled!! Did you buy anything? Marty, that is amazing! 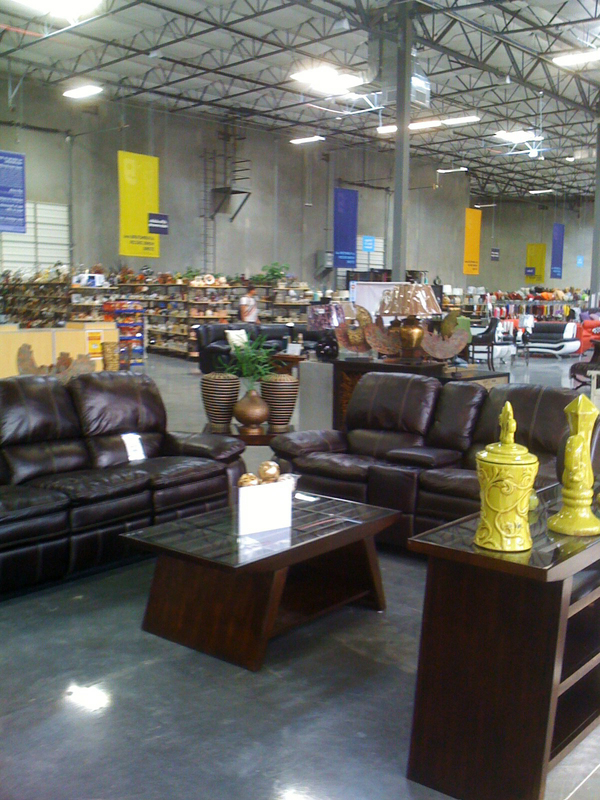 We have a GW close out warehouse in St Louis where you pay by the pound! I don't mean to introduce but I'm in the STL area. Where is this place?!?!?! Unlike any Goodwill, I've ever seen!!! Wow! Who would donate some of these beautiful things!? How absolutely wonderful this would be for young folks just starting out, struggling to get a home together. If the prices are as low as Goodwill stores, which can be a wee pricy at times, but usually good, it would be fantastic. None in Riverside. But I hope the idea spreads. I am very fortunate to have one of these stores nearby too! It is always fun treasure hunting there! Wow! I didn't know they had these kinds of stores either! What a fantastic place. and so many wonderful things! Thank you for sharing it all with us at TTF!